A month without water. For those of you reading this it seems an impossibility. For our brothers and sisters in the Azawak region of Niger it is a reality, not only one month but nine months of the year. We hope to change that reality. In our Montessori classrooms and in our homes around the world we need walk only a few feet to have access to water. Nine months out of the year in the Azawak region children must walk up to 30 miles a day for water; water that they must wait days for, water that is shared with livestock, water that often carries disease. Imagine nine months out of the year having no water in your home or your school or your town. Not only do we have ready access to water but it is clean and relatively inexpensive. We are truly lucky. A Month Without Water is a simple program. We are asking for Montessori families around the world to consider what they spend per month on water. Most people probably spend about $30 per month on water, which amounts to about $1 per day. We are asking that in support of the people of the Azawak region you consider donating simply the equivalent of what you pay for water in one month. If only fifty families from each school donate $30 each that would be $1500 from one school. 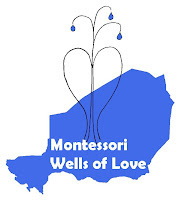 In many states across the USA, there are over 100 Montessori schools! If 100 of those schools raise $1500 each that is $150,000 which would cover the cost of one well! Together we can bring clean, readily accessible water to this region and give the gift of life! What an amazing gift to have the opportunity to give and what an amazing venture to be a part of. Please join with us in this simple program to help bring life and hope to the people of the Azawak region of Niger. To make your donation, please go to the Amman Imman website's donation page. Download A Month Without Water brochure by following instructions in these posts.